75201 First Order AT-ST is a Star Wars set released in 2018. Seize control of the First Order AT-ST! Play out a daring LEGO® Star Wars mission to make off with the partially constructed First Order AT-ST walker. 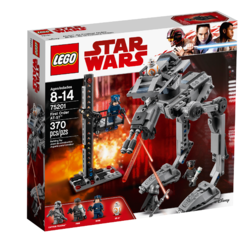 This exciting LEGO Star Wars toy features an under-construction walker with posable legs, a wheel at the back for rotating the turret, and dual spring-loaded shooters for intense action play. The set also includes a buildable hangar lift, so your Resistance fighter can enjoy recreating exciting scenes with Finn, Rose, BB-8 and Captain Phasma from the blockbuster Star Wars: The Last Jedi movie. Includes 3 minifigures: Finn and Rose in First Order disguise and Captain Phasma, plus a BB-8 figure. 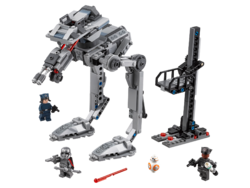 Features a partially constructed First Order AT-ST with posable legs, rotating turret function and 2 spring-loaded shooters. Also includes a buildable hangar lift with space for a minifigure. Weapons include Finn’s blaster pistol and baton, Rose’s blaster pistol and Captain Phasma’s blaster and spear. Use the lift to help the heroes board the walker. Recreate your own scenes from the blockbuster Star Wars: The Last Jedi movie. This LEGO® Star Wars toy is suitable for ages 8-14. AT-ST measures over 8” (22cm) high, 7” (20cm) long and 5” (13cm) wide. Hangar lift measures over 6” (17cm) high, 1” (4cm) wide and 3” (8cm) deep. Facts about "75201 First Order AT-ST"
This page was last edited on 9 February 2019, at 22:11.